It’s hard to believe that we have said our last summer camp farewells and kids are headed back to school. Hope all our friends on the Texas coast are staying safe this week. The last camper certificates have been sent out, and counselors are preparing for our afterschool programs starting right after Labor Day. (September is free, so don’t forget to sign up!). I’ve been having a blast going back through the counselor’s logs and certificates from the summer, and reading camper and parent responses to our survey. I’ve pulled together some highlights. We hope our campers will share some of what they did this summer with Connected Camps when they are asked about it in school too! 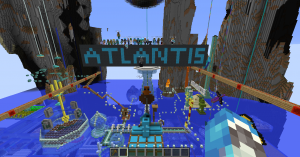 In our third time offering online summer camps in Minecraft, we served over 300 campers through our weekly camps, and our Kid Club server continued going strong. We have over 3000 kids who are signed up for our Kid Club server and nearly that many who have joined our various camps. We were also happy to have new community partners join us this summer, and to see Richmond California’s Building Blocks for Kids Collaborative again this summer. NPR even did a story on our summer program with Building Blocks for Kids! This summer we offered Adventure Camp for the first time, and it turned out to be one of our most popular camps! Each week had a different theme, and campers found themselves exploring Nordic mythology, crash landing on a cookie planet, living among friendly cow neighbors on Cow Paradise Island, and visiting Mario in Shroom Town. Whatever the location, campers worked together to solve problems, ranging from murder mysteries to saving penguins or escaping a maze-like vault. We also had new weekly themes for Architecture and Survival Camps this year. In Architecture Camp, campers traveled to the Greek colony of Arcadia and learned about history, food and culture while building landmarks and road systems. Other weeks focused on the watery world of Atlantis, the city of the Caesars, the red planet, Mars and the icy moon Titan. One particularly spooky week was spent in the burning embers of the Nether where architects journeyed deep into the earth to learn the mysteries of the core. 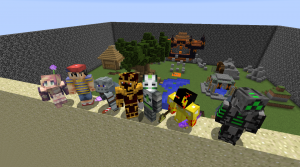 Our most popular summer camp in Minecraft again this year, Survival Camp featured new challenges and locations each week. Campers elected a town mayor and build a courthouse in the Aegean Archipelago. They farmed to make cookies and bread on a deserted jungle paradise. Other campers found crops on the Canyonland Mesa, traversed the Great Victorian Mesa, and braved the harsh snowy peaks of the Himalayan Mountains! Regardless of the location, all campers had the chance to kill the Ender Dragon through teamwork in a dramatic finale. Confronting the Ender Dragon is something that no Minecrafter will forget, and what almost all Survival Camp Campers mentioned as one of their favorite moments at camp. We were proud of our campers for taking on new tech challenges in our Game Design, Engineering, and Coding camps. Engineering campers leveled up in their redstone and circuitry skills designing homes with doors secured by keycards and combination locks, surprise traps, and giant fire-breathing dragons! 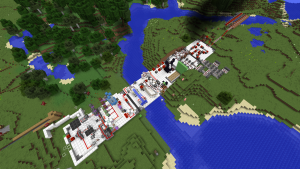 Each week campers created unique and fantastic redstone mansions with intricate contraptions. Campers even worked together to create an ultimate redstone carnival, featuring towering rollercoasters, a dunk tank, a rainbow beacon, and of course a giant snake statue. 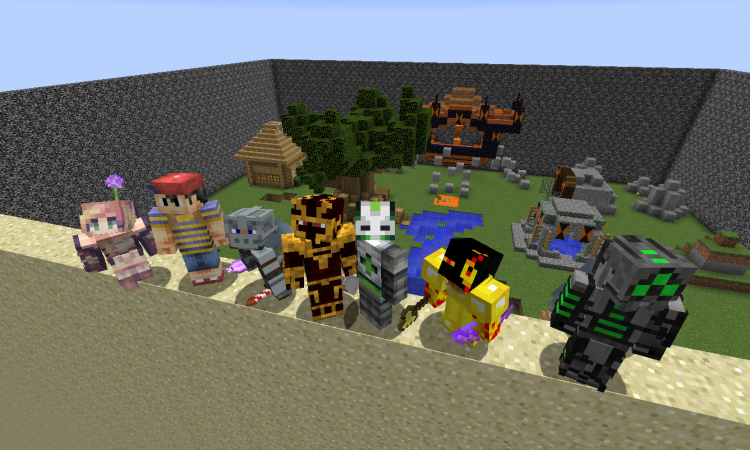 Budding game designers created minigames, parkour courses, puzzle dungeons, ender golf courses, and spleef arenas. Campers were free to explore the designs and genres of games they were interested in. We even saw a minecart minigame in a giant Pikachu and a rainbow-themed quick game and maze! We were proud of our campers who tackled coding this summer. Our camper surveys showed that most were coding for the first time, and almost without exception, they said that their interest in coding increased a lot because of the camp. Our campers who did the coding summer camps in Minecraft programmed turtles that moved around in game. They started with basic movement, and eventually moved on to programing them to create houses, making turtle bombers, turtle farmers, and more. This year, for the first time, we offered coding and animation in Scratch, a block-based programming language developed at the MIT Media Lab. Many of our parents have asked for next steps in coding so this is the first of a set of new offerings that can push kids interested in coding in new directions. Most of our campers were trying Scratch for the very first time. They created games like Pong, and worked together to build animated stories, and even remixed and modified games that other Scratchers had made. Every year we learn so much from our campers, counselors, and families. Big thanks to our whole community for continuing to join our programs, experiment with us, and help us grow and improve. Special thanks to the kids and parents who filled out our surveys and continue to give us feedback through our various support channels. It’s always a challenge to keep the technology running, and to get kids working happily together in online space. But it’s so gratifying when we do see kids of different ages and background embarking on adventures and solving problems together online, making at least one corner of the Internet a happy and healthy one for kids. 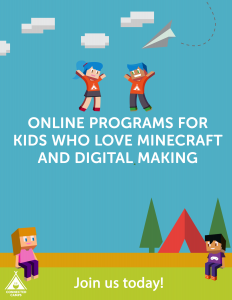 We’ve heard from parents and caregivers that their number one reason for joining our programs is to connect their kids to a friendly Minecraft community. Because our programs sounded fun, to be creative, and learn new tech skills were other big reasons. Even after summer is over and kids are back in school, our Kid Club server is still free and open for fun and friendly hanging out online, and our new afterschool programs offer weekly labs for kids to continue to work on their tech skills. Hope to see you there!